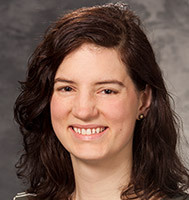 Terriss is a speech-language pathologist at the UW Health Rehabilitation Clinic in Middleton, practicing general outpatient pediatrics. She evaluates and treats children from birth to age 21 with varying diagnoses. Her special interests include developmental delays, articulation/phonological disorders, fluency disorders, and feeding and swallowing disorders. She is a member of the American Speech-Language-Hearing Association, and holds the Certificate of Competence in Speech-Language Pathology. She is licensed by the state of Wisconsin and sees patients upon physician referral. She received a Master of Science degree in speech-language pathology from Northwestern University.